John Reddington poses with his plaque, announcing that he’s been inducted into the U.S. Hides, Skin and Leather Hall of Fame. Last month, Ocean View resident John Reddington was the 31st person to be inducted into the U.S. Hides, Skin, and Leather Hall of Fame. Part of his role as president of the association would require Reddington to resolve trade disputes with foreign countries. “In China, there were hundreds of containers of hides that were stuck in one of their ports because there was a misunderstanding between the Chinese government, the Chinese importers and the U.S. exporters about the quality of the hides. I would travel to that country, meet with government officials, meet with trade officials, and bring a trade team with me. Within a few days we would resolve the dispute and all those containers would be released, everyone would get their money… When you’re talking about a couple of hundred containers, you’re talking about $50 or $60 million. These American companies were happy to see that I could do that. After receiving a bachelor’s degree from the University of Massachusetts and a master’s in Economics from Perdue University, Reddington worked as a foreign service officer for the first 23-years of his career — serving both in Washington, D.C., and abroad. He retired in December of 2000, and opened his own company, concentrating on trade disputes in January of 2001. He was simultaneously serving as vice president of trade policy for the American Meat Institute when he was asked to serve as the president of USHSLA. When asked about his three favorite career highlights with the association, Reddington recalled helping to put together a trade show in Hong Kong. “I convinced 25 American companies to come to the show. This was a three-day show, and over those three days American exporters sold $75 million worth of hides. That became a venue they went to every year from 2002 up to today,” he said. “Second, the hide industry had standards but they were convoluted and confusing, and misunderstood by the buyers as well as the sellers. So, I worked with the industry and came up with a new set of standards that’s now used by the industry and respected by major hide importers in the world. In 2013, Reddington retired from his position with USHSLA, having moved to Bear Trap Dunes as a fulltime resident in 2012. He’s spent his time in retirement as an active member of the community serving on the Ocean View Board of Adjustment, volunteering for the Town’s police department, and serving as Santa Claus for the Town’s holiday festivities. He also volunteered at the blood lab in the Veterans Affairs Clinic in Georgetown, and served as president of the Bear Trap Dunes Homeowners Association. Reddington said he was called by the association’s current president, Steve Sothmann, who notified him of his impending induction. 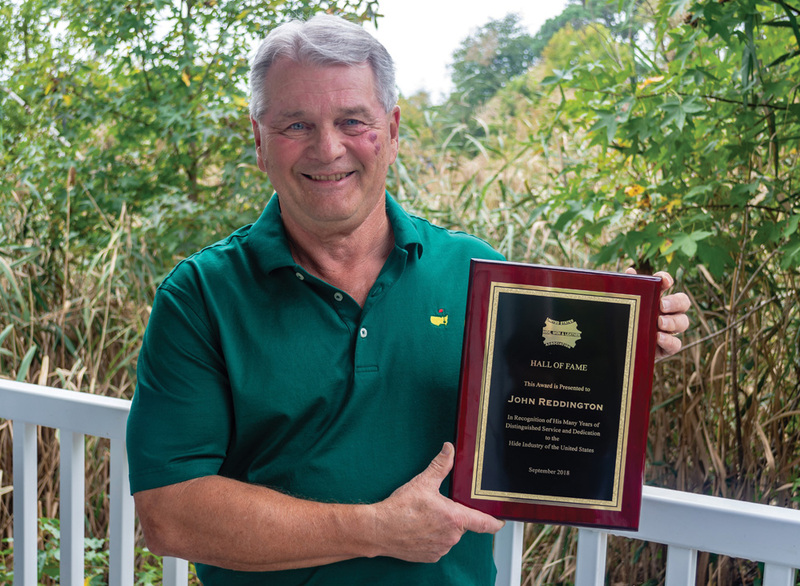 The award ceremony was held on Sept. 26 in Chicago, Ill., where Reddington was honored for his significant contributions to the association and its industry. Reddington was able to attend the ceremony, held at the Intercontinental Hotel, with his wife, daughter and son-in-law. His vision and proposed changes to the U.S. Hide Association revitalized and restored value to the U.S. hide industry in the U.S. and worldwide, according to Chris Mullalay of Mohawk Trading, a New York hide exporter who have the induction speech. Sothmann noted Reddington was a shoe-in for the Hall of Fame. Sothmann, who worked under Reddington prior to his retirement, said he was grateful for the opportunity to work with him and see him inducted into the Hall of Fame.